In previous papers we described the implementation of a system which combines mathematical object generation, transformation and filtering, conjecture generation, proving and disproving for mathematical discovery in non-associative algebra. While the system has generated novel, fully verified theorems, their construction involved a lot of ad hoc communication between disparate systems. In this paper we carefully reconstruct a specification of a sub-process of the original system in a framework for trustable communication between mathematics systems put forth by us. 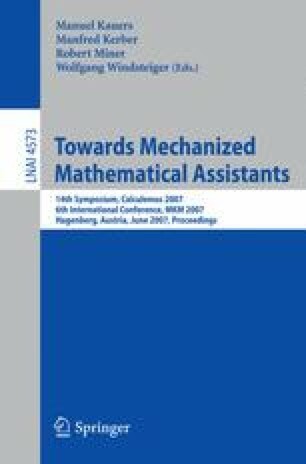 It employs the concept of biform theories that enables the combined formalisation of the axiomatic and algorithmic theories behind the generation process. This allows us to gain a much better understanding of the original system, and exposes clear generalisation opportunities.